Lily's Quilts: Would you give it a go? Would you give it a go? Amitie BOM block, originally uploaded by Lynne @ Lilys Quilts. If I posted a tutorial for a simplified version of this block in weekly parts, would you give it a go? You could make a small wall hanging or a pillow or just have a play and make a block just because and to use up some scraps. We'd be practising foundation paper piecing which is actually very simple and is a great way to get very pointy points. If there's enough interest, I'll write it up but otherwise I'll just file it in a small drawer in the back of my brain where it will probably get lost for a few years then re-surface as some inopportune moment. yes, I love paper piecing! I would be interested - already paper piece, but the more modern and circles are something I need to work on with encouragement. I would definitely give it a go. I've not done too much of it and would love to have more practice. Yesssss! I've been loving this block but never thought I could even try to make one, so please, and thank you! wow...i'm impressed. it would be a fun one to test out. I wouldlove to try this block. I've only paper pieced a few times but I loved it although still need practice. I think it would be fun! I want to learn paper piecing, but I am intimidated. I love the circle too. Please give it a go! I'd love to follow along and make a pillow...or something!! I'd give it a try too. Though I might not manage to keep up. Go on then, I'm game for a laugh! I'll join in the fun. I need more paper piecing practice. I like a challenge and would give it a try. Most likely, I'd use the block in a quilt with other challenging orphan blocks I've made. For example, my "Cuesta's Choice" block, which you can see on my Flickr photostream. I'll join in the fun! I'd love to learn how to make this block. Yes!!! Me encantaria aprender a hacer un blogque como este. I would love to try it. Yes please. Yes, i would love to give this a try. If you promise its not really hard and scary... Ill give it a try. Even if you lie, its ok, Ill believe you long enough to try the tutorial haha. I would love to learn how to make this block!!! I would love a tutorial. 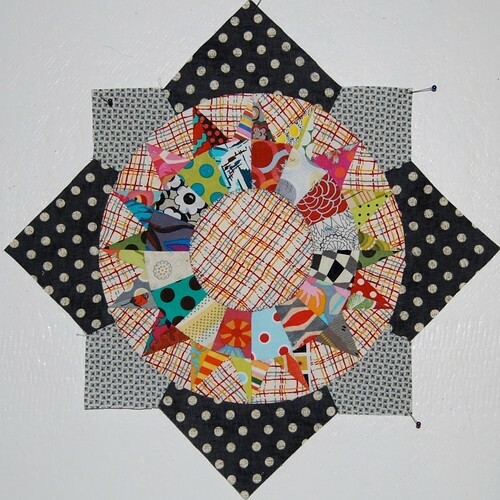 I need to get over my paper piecing phobia! Another of your loyal subjects responds in the affirmative Sire! Yes please! I would definitely be interested. LOVE IT! It would be great to make a small project like that mine would be a pillow! YES! Count me in! Love the block! I'd definitely give it a go! I love love love this block, but...I'm skeerd! Maybe if you post a simple weekly tutorial, I might be brave enough to try. Well if you say it's a simplified version I would totally try it. This would be a humanitarian contribution to quilters' mental stability worldwide !!!! I have no paper piecing experience and this would be a wonderful project to learn on. Thanks for offering the pattern. I'd love to follow along and make this!! lovely choice in fabrics you've got!! I will give it a go, although I had NO luck with the last circle/dresdan plate block I've made before. I need all the help I can get. Oh Yeah! I would follow along! Ooh! I'd give it a go. Oooh, yes -- I'd surely be interested! I'm always willing to give it a go, sometimes I even manage it!! Yes please, I would love to try a new technique. No rush though - I've got plenty of projects backing up and spring is a busy time in the garden. I've never tried paper piecing but would love to try if someone walks me through it! Oh, yes! I definitely would love to give it a go! I'm doing my first paper piecing project and really am enjoying it! I would for sure make it, and your instructions are good and easy to follow so they would be a help. Please do. Yes, I would definitely give it a go. Paper piecing is fun! Yes, I would love to try this pattern. Oooooo yes plz!! With a cherry on top! I've got a pile of scrap that would go nicely with that block. Yes please! Yes - I love a challenge and have never paper pieced! I would love to try this block - but I didn't find a tutorial for it. Could you direct me where to find it. Thank you so very much.